We love making beer bread around here. It’s so quick and easy and comes out great every time. It’s the perfect thing to throw together and take over to friend when you’re invited for dinner. 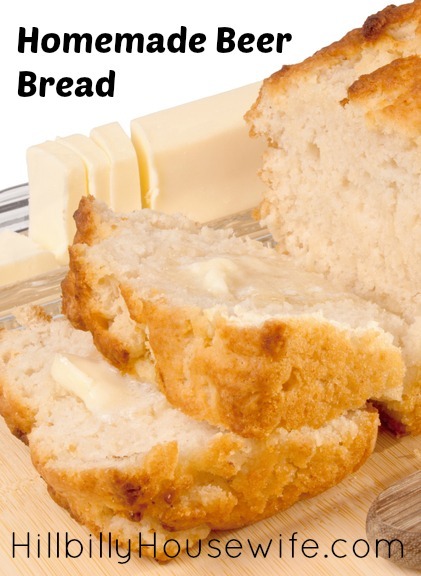 Beer bread and a little butter makes a great appetizer or snack. Make sure you use self rising flour or add some baking powder to regular flour. Otherwise the bread will get quite dense and can come out on the dry side. Try making this with different types of beer. A regular pilsener style beer will be almost flavorless and the bread will be light and fluffy. Use a stout or dark lager for a darker more flavorful bread. I’ve tried using flavored beers and the bread does have a slight flavor from the beer, but not very much. We have this as a snack with a little butter or eat it with any soup or stew. It’s too crumbly for sandwiches but very yummy, especially warm from the oven. While preheating oven to 350 degrees, in a large mixing bowl, add the beer, sugar and flour. Stir until just blended. Note: the mixture should be lumpy. Pour the mixture into a greased loaf pan and bake for 50 minutes. Remove from oven and evenly pour the melted butter over the top of bread. Put back in the oven and bake for an additional 10 minutes. 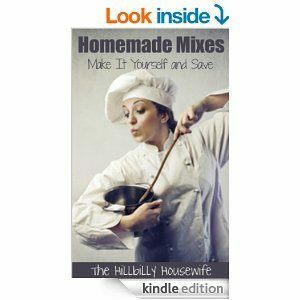 Get a copy of the 35 Homemade Bread Recipes Kindle Cookbook here.